Warden Bernie MacLellan is swinging for Habitat for Humanity, in Huron County’s Annual Charity Golf Tournament taking place Friday, July 13th at the Seaforth Golf Course. Shotgun start at 11 a.m. Registration is $125 single or $500 for a team of 4, which includes 18 holes of golf, cart, lunch, gift and dinner. A tax reciept is available on request. Don’t worry if you haven’t registered yet…there is still time, although to be assured you don’t miss out call now to reserve. There is also an opportunity to participate in a mini-putt contest and a surprise “Big Break” competition for more prizes. 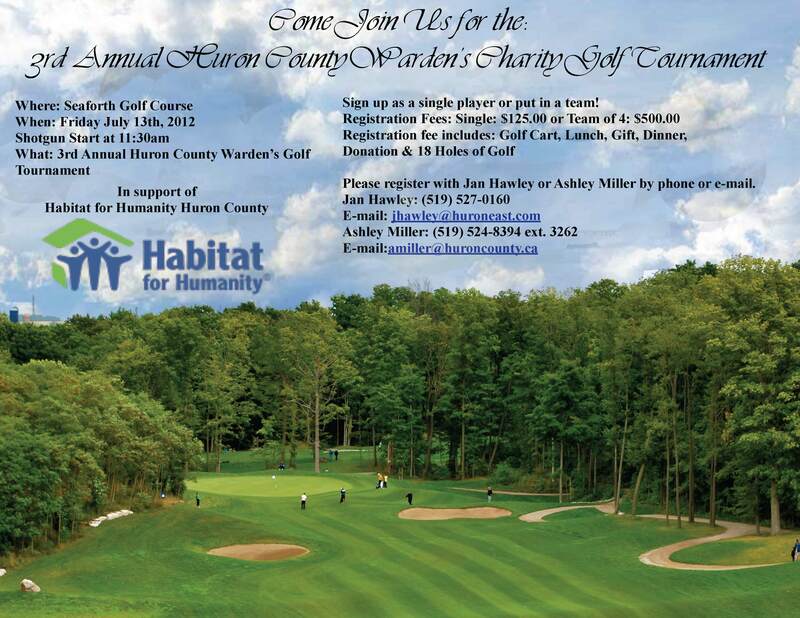 All funds raised from the Tournament will be given to Habitat for Humanity Huron County. Come out and support a great cause….register today! This entry was posted in Uncategorized on June 18, 2012 by Jan Hawley.